Some people pride themselves on how safely and carefully they drive, but that doesn’t mean it’s impossible for you to get into a car accident. Oftentimes, safe drivers can get into bumps and scrapes due to another driver’s recklessness, and though that may be frustrating, you'll have to get the damages fixed in order to maintain the vehicle’s condition. Most accidents, especially the ones that involve the safest of drivers, only result in small damages such as damaged paintwork or dents. Luckily, dent repair in Perth is far from expensive, and there are numerous companies in the area that offer great prices due to the sheer amount of competition within the industry. Smash repairs by Perth's K&W Panel Beating is one example of an affordable fix, but understandably, you may wish to compare the market before deciding on which company to go with. However, no matter which provider is chosen, drivers who’ve recently been involved in an accident should get repairs done as quickly as possible to prevent issues from worsening. 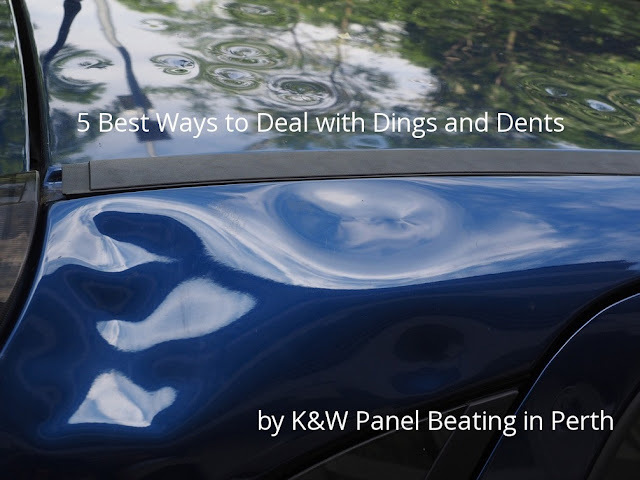 This article offers five ways in which you can deal with dents. If you have been involved in an accident that was somebody else’s fault, you may be able to ask the other driver to cover the costs of repairing the damage. This might be a good option if the damages are so small that calling the insurance company isn’t the best way to go. If the damages sustained will be expensive to repair, the insurance company may have to get involved. Drivers should be aware that this could affect their premiums in the future, and that’s why it’s better to come to an agreement with the other driver in certain situations. Small scratches can sometimes be eliminated by using products such as car wax and polish. Of course, the person to blame for the accident should cover the costs of purchasing the product, but it may be the easiest way to have the damages repaired as quickly as possible. Some drivers may have a family friend or relative that knows a thing or two about cars. If you are lucky, you may be close friends with a mechanic. This will be cheaper than heading straight to local repairers. If the driver is left with no choice but to pay to have their own vehicle repaired – regardless of who was at fault – it’s important to choose a high-value repairer that will carry out a similarly high-quality job. Needless to say, it’s frustrating when you are forced to pay for your own repairs when you didn’t cause the accident, but it’s still vital to have repairs done as quickly as possible. Luckily, if the damages sustained by the vehicle as a result of a crash were just to the bodywork, repairs shouldn’t be too expensive as long as the right company is chosen.